About Us | Lavet Kft. Lavet Pharmaceuticals Ltd plays a key role in the veterinary market both in Hungary and Europe. The company was founded by Hungarian investors, with the aim to provide a wide range of high quality yet affordable pharmaceutical products for both the national and international veterinary markets. The company’s main activities include the development, registration and manufacture of veterinary medicinal products where first and foremost responsible behaviour is kept in mind. In the spirit of the slogan of our company “You Love We Care”, our experts constantly strive to help the animal owners’ in everydays’ care with our products as efficiently as possible. During the development process our primary goal is to provide the best solutions for prevention and treatment of possible veterinary issues by utilizing practical knowledge as well as the latest research results, taking into account the needs and problems of animal owners. In order to remain devoted to our slogan we are continuously launching more and more research and development projects. We are continuously developing our manufacturing capacity and the professional skills of our staff. Our goal is to create a corporate environment and maintain a future vision that is consistent with the professional and personal ambitions of our employees, thus promoting the adequate involvement and creating a responsible and innovative atmosphere. 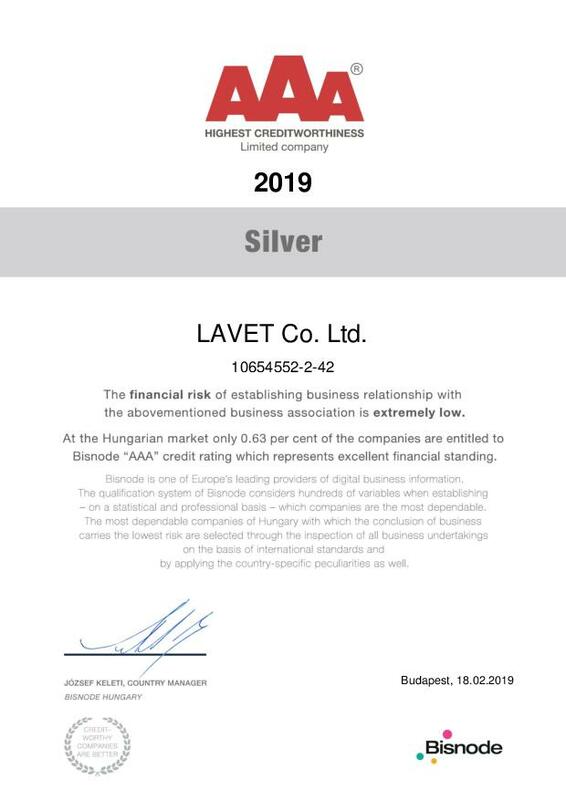 Market-orientation, up to date knowledge, dynamism and competence characterize the current strategy of Lavet. Since our company operates in a market where a high-level quality, innovative organizational and product development attitude is essential, therefore flexibility and teamwork characterize our daily activities. Daily contact with animal keepers and veterinarians is essential in order to maintain flexible and innovative market behaviour. During development work the latest scientific results and technological progress are monitored and utilized. We constantly follow and apply the latest scientific and technological developments in production and development activities. We believe that our responsible behaviour, philosophy and future vision are to guarantee that LAVET maintains its decisive role in the future veterinary market.